Welcome to our online showroom! Here is a representative sample of our complete inventory, which includes a wide variety of high quality styles and designs at affordable prices. If you're not already familiar with Wndhollow Foundation and our reputation for excellence, please take a moment to review the three main reasons shoppers consistently choose Windhollow Store as their source for Native American products in the SW Oklahoma and Great Plains area. Native American Foodstuff Books & Literature Much, much more! UPDATE! Nearly 40 items have now been successfully SOLD on our Wind Hollow Native Store website! Keep coming back OFTEN to view MORE Native American arts and crafts for your consideration! 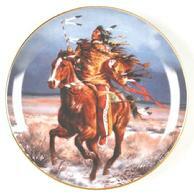 Native American Commemorative Plates -- SOLD!! Ty Duwyenie Original Kachina Art -- SOLD!! 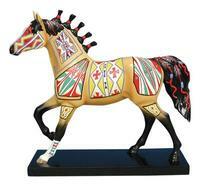 The Trail of Painted Ponies -- SOLD!! Tyrone (Ty) Duwyenie (Hopi Pueblo/Hualapai). 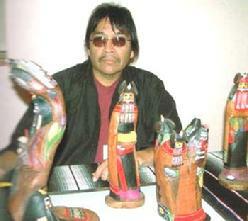 Ty started carving katsinas around 1978, he is also a performing artist, singer and musician. Ty lives in Scottsdale, AZ and is the grandson of Thomas and Belle Kuyiyesva, Andrew Duwyenie and Sarah Duwyenie; son of Winston Duwyenie; bother of Starley Duwyenie. Ty learned his carving from his father. His favorite figures are the White Buffalo Dancer, Ogre Katsina and the Antelope Katsina. And, coming soon...don't miss Wind Hollow Foundation's eBay Store! Wind Hollow Foundation copyright 2014. All Rights Reserved.